Clinical diagnostics laboratories utilize a wide variety of instrumentation to measure critical care analytes. These instruments range from manual point-of-care bench apparatus to high-volume, fully automated free-standing systems. Testing is performed using all types of body fluids, including serum, whole blood, urine, cerebrospinal fluid, and others. The results of these tests provide clinicians with critical information for diagnosis, prognosis, and constant monitoring of patients’ medical status. Clinical laboratories are generally divided into basic units, such as Chemistry, Hematology, Coagulation, Immunoassay, and Microbiology. 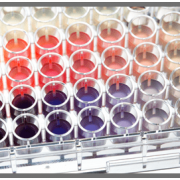 These units perform tests that are grouped according to the type of analyte and/or to the methodology of measurement. Clinical Immunoassay is a branch of chemistry that involves measuring serum proteins using immunological methods such as nephelometry, turbidimetry, immunoassay, immunofluorescence, and chemiluminescence. Immunoassay instruments facilitate the measurement of diabetes-related markers, infectious disease antibodies, cancer markers, transplant proteins, and fertility proteins, and provide a different methodology for measurement of some analytes that can also be analyzed via traditional biochemical techniques.